Charlie has been with the Company for over ten years and has concentrated his efforts in the sale and leasing of mid size investment properties. 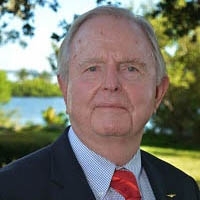 Prior to his arrival in Vero Beach, he developed commercial real estate in Mississippi and he was also a successful entrepreneur who capitalized on industrial incentives in Mississippi. Charlie is a retired Navy pilot and he also holds a BS degree in Industrial Management from Mississippi State University. He and his wife reside in Vero Beach and he has two grown children.